I believe I have enough flannel pajamas to last me a while now. I used Kwik Sew 2811, since I had good luck with it in the past. The first time I used it was in 2003 and those pajamas are threadbare so it was definitely time to retire them and make some new ones. I don't know about you, but I find it much harder to part with something I've made than with something I've bought. 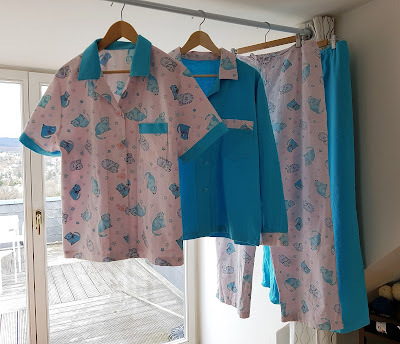 I started out intending to make one pair, using the cat print flannel, but discovered that I didn't have enough fabric to make a long sleeved top. This was in November and I wanted them "now" so rather than order some fabric on line, which could take a few weeks to be shipped to my APO in Germany, I looked for flannel locally. It wasn't easy! Fortunately I found some coordinating turquoise and bought more than I needed for a long sleeved top, intending to use the pink cat print as an accent to coordinate with the cat print pants I'd already cut out and sewn up. As luck would have it, the flannel sold here in Germany is wide - the US-bought flannel from my stash was only 44 inches wide and the German flannel was about 54 inches - so I had enough for long pants as well. Then, since I had enough pink cat print for a short sleeved top, I figured, why not? Now I have mix and match flannel pajamas to last me a long time. Very clever! I love mix and match jammies.